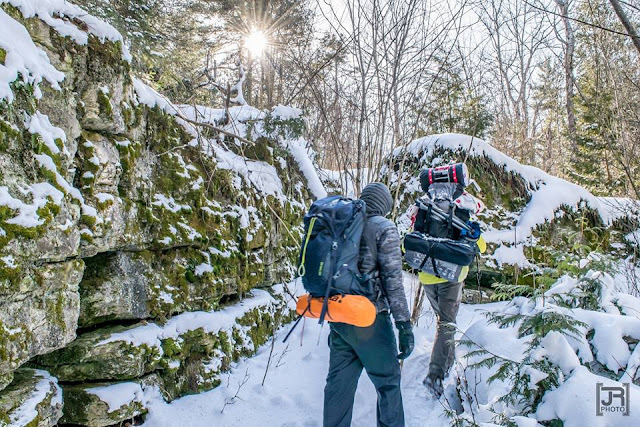 There are 49 state parks in Wisconsin but there’s only one that offers a true backcountry experience. And that’s Newport. 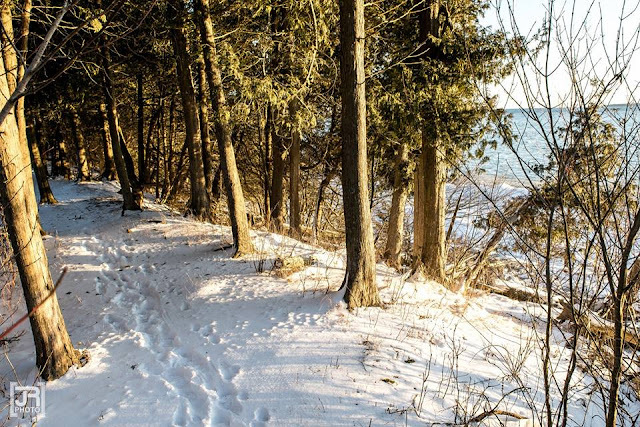 Located way up along the eastern tip of Door County, Newport State park is home to 2,373 acres of pure wilderness nestled along eleven gorgeous miles of Lake Michigan coastline. Clearly, after reading the previous line of text you should already be planning your next trip. 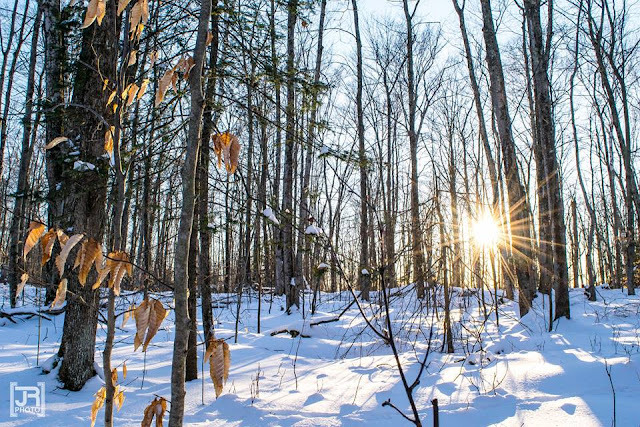 What set’s Newport apart from other state parks in mainland Door County like Potawatomi, Whitefish Dunes and Peninsula is its formal designation as Wisconsin’s only wilderness park. In simple terms, it has been and always will be minimally developed, allowing for nature and conservation to stride ahead without interruption. That sounds absolutely perfect to me. When the master plan was finalized in 1973, the following four objectives were set in place for Newport State Park. Manage the park as a wilderness area. 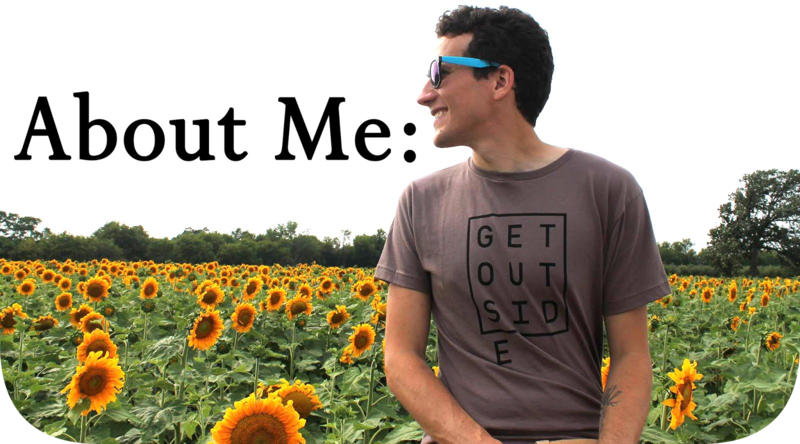 This concept of a protected wilderness park is something that truly fascinates me because it’s something we’re lucky to have and quite frankly, something we need more of in our park system. Newport attracts a different breed of travelers looking to recreate. A breed craving an escape into the outdoors and looking to fill their monthly wanderlust quota. A breed that would rather hike with a heavy pack on their back miles into the quiet woods away from noisy, developed campgrounds littered with RVs and pop-up campers. A breed that isn’t intimidated by the words ‘primitive’ or the thought of carrying-in your own drinking water. If this is you, you need to get to Newport. 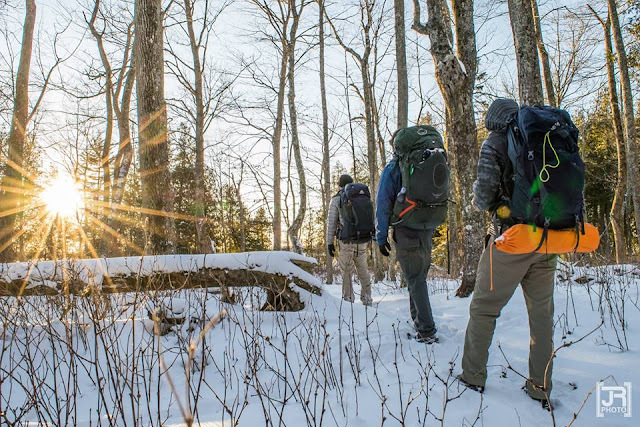 Four friends and I recently took a weekend trip up to Newport State Park, in the beginning of March to kick-off a new year of backpacking. We planned for weeks, chatting over the itinerary, where we’d camp each night, what meals we would eat and what essential pieces of gear would be in whose pack. 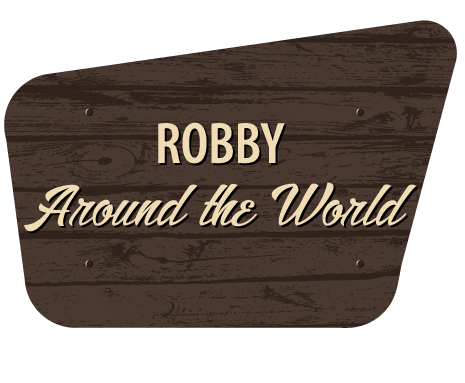 When the time came, we put in for vacation re quests at work, loaded-up a station wagon and hatchbacks and headed north. This was the second time I had gone backpacking at Newport State Park. Something about this magical place left a very, very special impression on me three years prior, so I was stoked to return. This time with good company. We arrived Friday afternoon and after checking-in at the park office, we filled up with a night’s worth of water, strapped on our packs and hit the trail around 4pm. The plan for our trip was to camp at one site the first night and then hike around eight miles to another backcountry site in the northern part of the park the second. As the sun slowly started to set, we trekked on south along the Rowleys Bay trail towards camp one, backcountry site 12. It was like walking through a big snow globe with soft beams of golden sunlight trying to pierce through the thick, frosted pines above. If they were successful, patches of the trail we’d walk on put us in a brief, spotlight of warmth. It was mesmerizing. The trail continued along some 2.5 miles down the eastern shoreline of the bay and we eventually reached backcountry site 12. Out our tents we had wide views of both the sunset and preceding day’s sunrise. 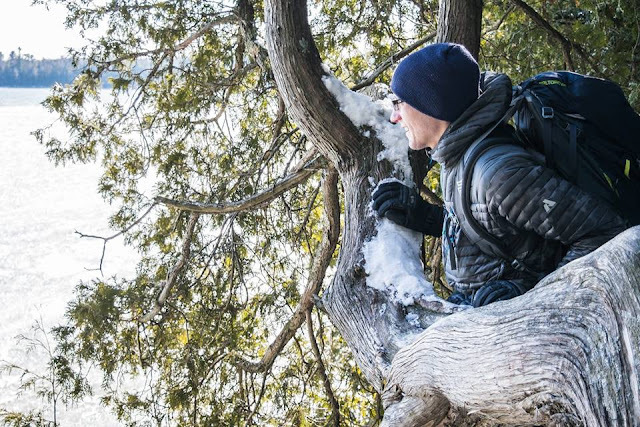 We all set up our one and two-person backpacking tents and as temperatures continued to plummet, getting a roaring fire going with whatever dry deadfall (fallen, dead trees or sticks) was a top priority. 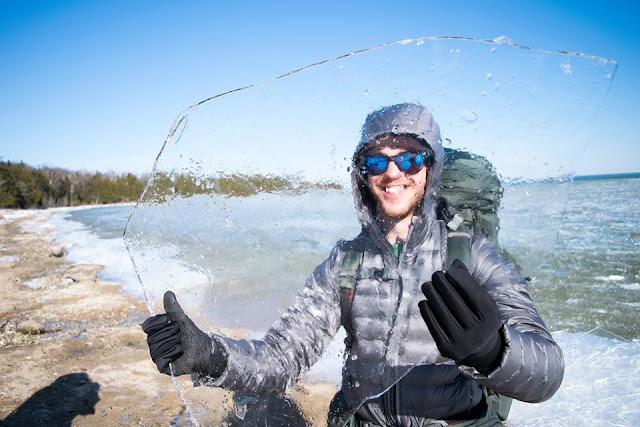 I walked a few feet away from our campsite towards the frozen shoreline of Lake Michigan. A sole trumpeter swan was floating around by nearby Vareny Point, almost camouflage with the surrounding snow and ice chunks. The sunset painted the sky with hues of vibrant orange, yellow and pink as it fell west. Sam boiled up some water and we were soon scooping once-dehydrated grub out of our bowls by the fire’s hospitable flames. It’s impossible to describe the stars at Newport. As soon as their backdrop goes black, millions if not, billions of bright, stars come out and dance away in a show up above. It is just, jaw-dropping. 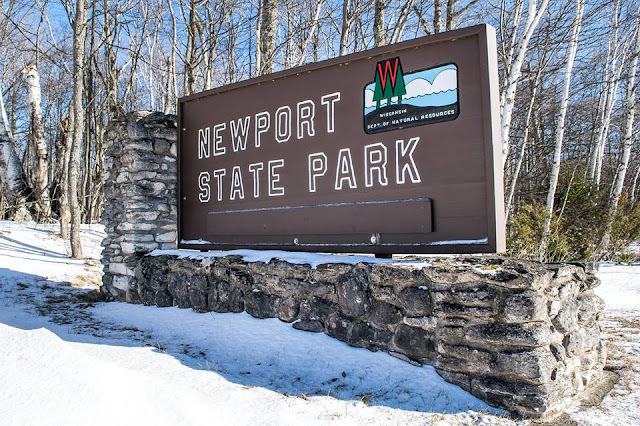 Newport State Park is currently in the works to be approved as a recognized. 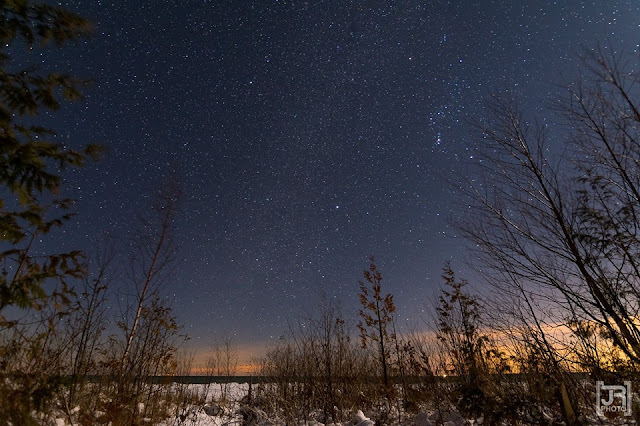 IDA International Dark Sky Park. It’d be the first and only state park in Wisconsin to have this designation, joining only a small list of other prized national and state parks across the world. While the pictures my friend Jake Rivard took to accompany this piece are nothing but breathtaking, you have to see it for yourself. Saturday morning was freezing, even despite the majority of us being prepared with an arsenal of solid down backpacking gear. We chatted over oatmeal, tea and dehydrated strawberries about how a temperature reading at one point overnight got to just two degrees, not including the bitter wind chill that had been weathering our faces for the past twelve hours. As last night proved, Newport is a gem of the Wisconsin State Park system. It was hard to write this post without wanting to shut my laptop off and just get back up there to experience it again. I plan to do so once Spring weather moves across the Midwest. After packing up our gear, we bid farewell to backcountry site 12 and began our three-mile hike back to the park headquarters where Mark, another close friend, would meet and continue with us to camp two located at site 16 about five miles away on the northern end of the park. After refilling with water, we cooked up a quick meal of rich, gooey macaroni and cheese in the parking lot out the back of Mark’s Honda CR-V. The five of us followed the Europe Bay trail north, along the frozen shoreline of Newport Bay and out along craggy, Lynd Point which provided elevated views of the chilly chaos in the water below. As we approached the point, we stopped in our steps, amazed at the rows of ice sheets stacked up against each other like big pieces of broken glass. 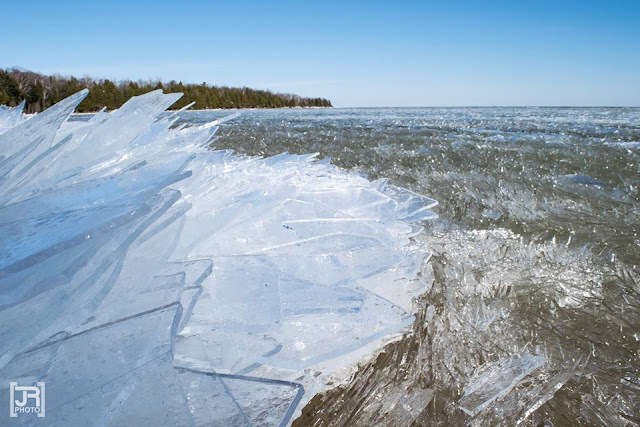 I had never seen anything like it before and we all took turns picking up square pieces of perfectly intact ice, peering through them like windows. Jake captured a few slow-motion videos and high-speed pictures of us shattering the thin panels of ice with our gloved fists. We pressed on and headed inward from the lake in an effort to avoid the increasingly strong, bitter winds. At one point on the Europe Bay trail, the path carved through a maze of tall, rock. Almost like a slot canyon, covered in snow with a canopy of pines above. About 3.5-miles into the hike, we stopped to take-off a few layers and hydrate. 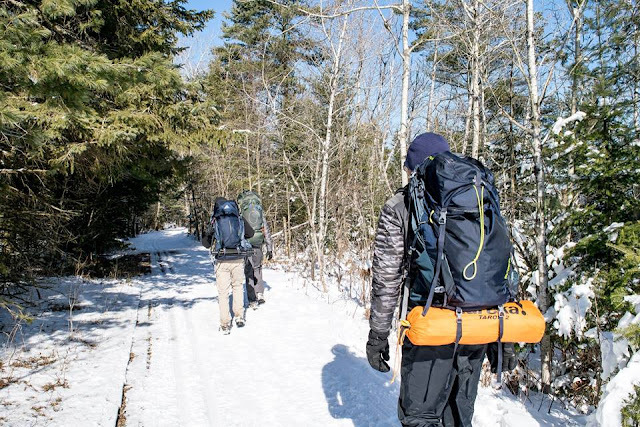 Backpacking in ankle-deep snow with a loaded pack on your back while you’re suited-up in puffy down jackets and liners can be straight exhausting. We finally reached site 16 and set up camp two for the night. The site was gorgeous, atop a sand dune with beach access just steps from our fire pit. We kept an eye on the forecast throughout the day and were prepared for wind, but when we arrived at our backcountry site, the gusts were treacherous, dropping the already-low temperatures down even lower. Instead of setting up our four tents atop the sand dune ridge, we found a clearing below the pines just below a steep hill that would help to block out the harsh gusts blowing west off the lake. Soon camp two looked like a small town of small, colorful backpacking tens all in a circle. 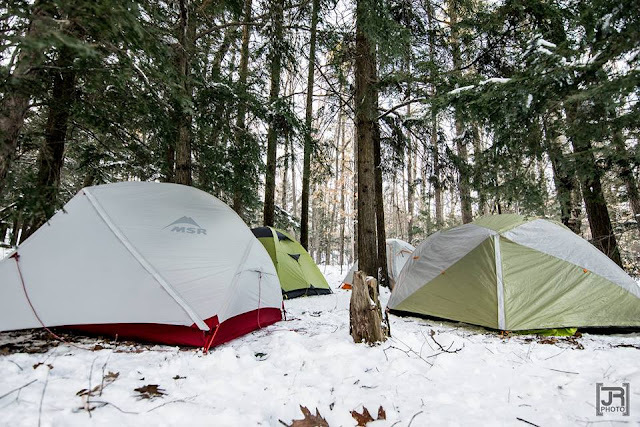 We secured our tents to the ground as best as we could and sought out whatever big pieces of fallen trees or branches to place at the base of our tent vestibules, in a continued effort to minimize any frigid blasts of wind that would penetrate through into our tents as we slept. The sun began to fall and after dinner, we decided to craft a makeshift fire pit by our tents, at the base of the steep hill for warmth. Starting a fire up above near the sand dune ridge was impossible due to the ferocious wind. I walked down towards the water with Jake who had setup his tripod and was experimenting with various long-exposure settings on his camera. 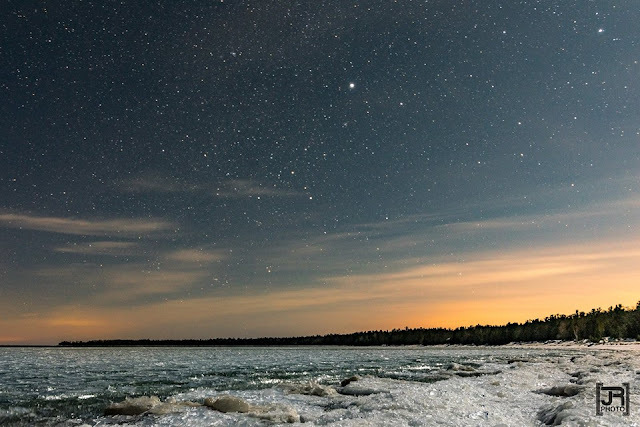 The moon was blinding bright, reflecting off sharp pieces of ice resting up against one another near the shoreline. but once again we were treated to a front-row star show. Standing there looking up at billions of stars, you’re reminded of just how small we really are in such a big universe. Cliché, yes, but when you go there and look upwards, you’ll agree. Seeking the flames, we headed back up the dune to camp to join the others. For the next few hours we all sat close around the tiny fire, passing around dehydrated apple slices and a flask of cold Jose Cuervo. 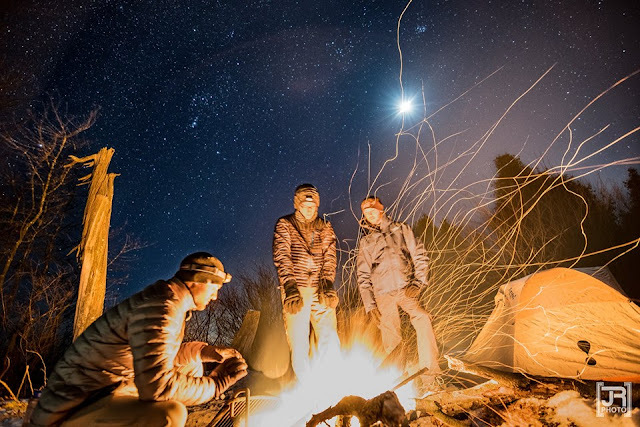 We talked about the stars, the wind bashing the trees together up above, future trips, life outside the backcountry and all things in between. The winds continued to pick up and we headed to our tents. 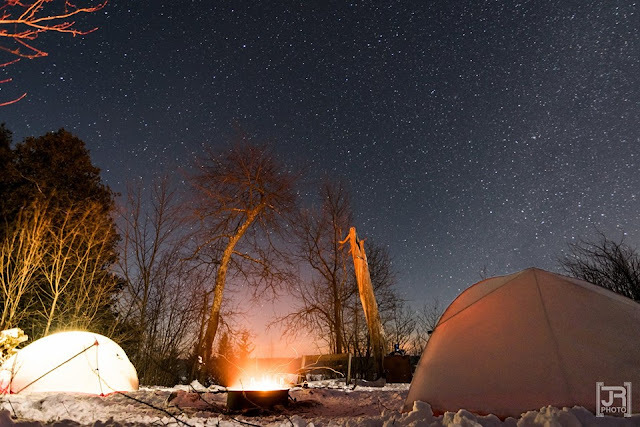 Some read by headlamp, others crashed right away burrowed deep in their down sleeping bags. The next morning, I heard my watch beeping somewhere in the abyss of my down sleeping bag. I scurried to find it, its orange glowing face read 6am. I called out to Jake that I was getting up to go down and see the sunrise. The wind was still aggressive and temperatures were only slightly more bearable than the night before. Opening the tent door to grab my boots out of the vestibule which was flapping rapidly I looked over at one of my Sawyer water filter pouches which had frozen overnight. I climbed the path up the hill and headed towards the shoreline, hoping to catch the last few minutes of a never-disappointing Door County sunrise. I stood there, completely awestruck. Once the others awoke, we boiled up some water for a final feast of oatmeal and dehydrated fruit, tore down camp, erased the area clear of any of our trace and strapped on our packs for the return hike back. We were already joking about craft beers and butter burgers for lunch at the closest pub we could find. Jake delicately set-up his tripod for a group photo. Our five faces weathered, tired, crusty and smelled like thick smoke- but we all wore a sentimental smile signaling the completion of an epic winter backcountry adventure.